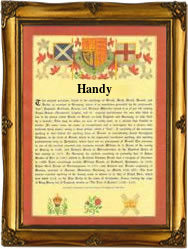 Recorded as Hand, Hands and Handy, the latter being a diminutive, this unusual surname is English. It is believed to be a nickname derived from the Olde English pre 7th Century "hand" which means what it says, and was used to denote a person with very large hands, or possibly one whose specific job required the continual use of "hands". A sizeable group of early European surname were gradually created from the habitual use of nicknames. The nicknames were given in the first instance with reference to occupation, or to a variety of characteristics, such as physical attributes or peculiarities, mental and moral characteristics, supposed resemblance to an animal's or bird's appearance or disposition, and habits of dress. It is also possible that some of the nameholders may derive from the Saxon personal name "Hans", a variant of "Johannes", itself from the Hebrew John. However as the term "hand" is still used to denote a sailor, this seems the most likely source. In the plural, when it occurs, the name means "the son of Hand". Early examples of the surname recording include Robert Handy of Warwickshire in 1370, whilst Richard Hand, aged 19 yrs., who embarked in the ship "Hopewell", from the Port of London bound for Barbados on February 17th 1634 was an early emigrant to the future USA. The first recorded spelling of the family name is shown to be that of Walter Handes, which was dated 1332, in the "Pipe Rolls of Warwickshire", during the reign of King Edward 111, known as "The Father of the Navy", 1327 - 1377. Surnames became necessary when governments introduced personal taxation. In England this was known as Poll Tax. Throughout the centuries, surnames in every country have continued to "develop" often leading to astonishing variants of the original spelling.